2014 saw 18 new WASP planets published, our most productive year yet. As the green histogram shows, our success at planet finding continues to increase as we accumulate more and more data. While Kepler exceeds us in terms of sheer numbers, and in finding small planets, it is important to realise that our planets are usually around much brighter stars, and so are often much better targets for ongoing studies. 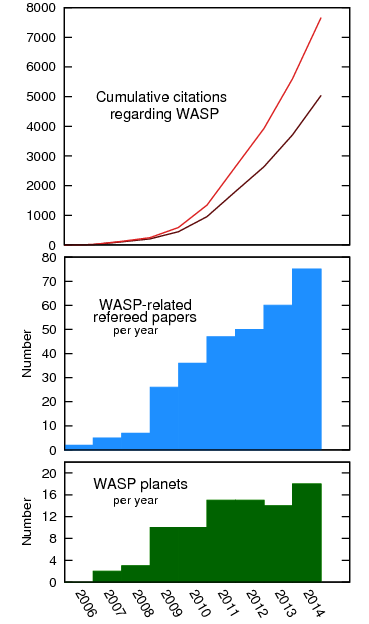 Refereed papers related to WASP (either about WASP planets or using WASP data) are also climbing strongly, with 75 new refereed papers in 2014 (blue histogram; and see the listing here). Of course most of these are now by third parties, rather than by the WASP consortium itself, which shows the strong and increasing interest in WASP science from groups worldwide. 2014 was also the best ever year for citations regarding WASP science. There were over 2000 citations in the refereed literature in 2014 to papers that mention WASP either in the paper title or in the abstract. The cumulative number of such citations, shown as the lighter red line, is now over 7600. The darker-red line is the same, but for citations only to papers mentioning WASP in the title (which many papers about WASP do not). Thus the WASP program is healthy and productive, and we expect that it will continue to dominate the discovery of transiting exoplanets around relatively bright stars until the launch of NASA’s TESS mission in late 2017. This entry was posted in WASP planets and tagged citations, papers on January 8, 2015 by waspplanets.